My version of Med-Ling, served up all pretty. Med-ling. That’s what we call it at work. It’s one of our newest dishes, Mediterranean Linguini, supposedly found on one of the owner’s world tours. This time supposedly he made it to Greece and adapted this recipe to work for the restaurant. Whatever, it tastes good, and I wanted to recreate it my own way. Of course we have to know all the ingredients, so I had an idea what I would need to recreate it. It’s simple really. but I couldn’t just stop there. Don’t get me wrong, the original is amazing. Mine was better. 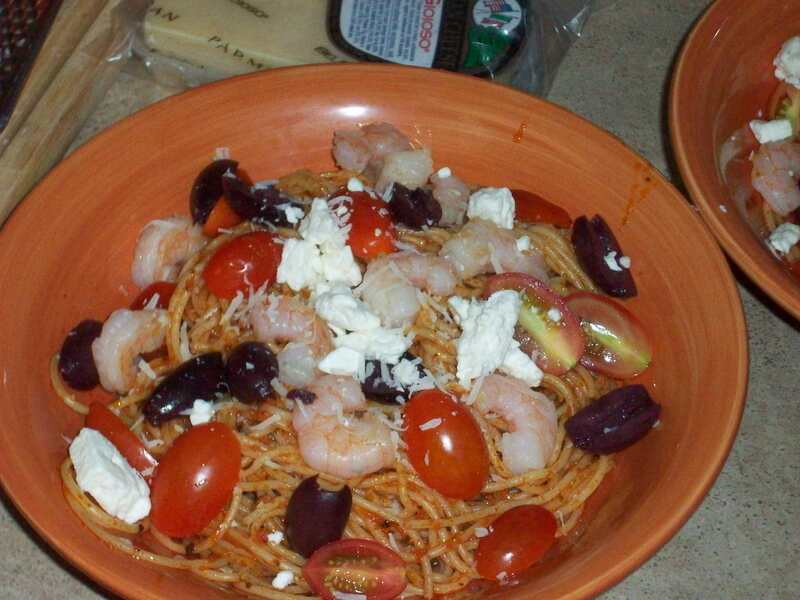 It has grape tomatoes, kalamata olives, feta cheese, and the linguini tossed in a tomato olive oil sauce. I found out from one of our chefs at work that I have befriended that the sauce is actually just oil simmered together with some of the pizza sauce we use. So I used some leftover jar pasta sauce and simmered it together with the olive oil. I then added in some “sneaky spice” which just means cayenne and cinnamon to balance it out – though I’m not telling what measurements… I also enhanced my sauce with some basil and parsley and onion powder and garlic powder…oh my goodness it was yummy. And since it was an oil based sauce, it lingers on the lips and tongue. At work, customers have a choice of chicken or shrimp to add in if they want some meat. I chose shrimp for mine, it takes me back to living in Italy. For my shrimp, I sweated some onions and toasted some garlic in a pan, and then just warmed up some ready-to-eat shrimp with the tails cut off. Throwing those on top was the perfect little addition to this already tasty dish. To serve with it, I took some bread that I had leftover and drizzled a little olive oil on it so that it would be crusty in a 375 degree oven. Once it was good and crispy, I rubbed fresh garlic over it, grated up some parmigiano-romano cheese and popped it back in the oven just to melt the cheese. Fantastic. I can’t wait to tell that chef at work about my newest (re)creation. This entry was tagged cheese, oil, olive, pasta, tomato. Bookmark the permalink.